“Dr Halina, surat keje dah sampai” that was ayat sentap from Kak Ita, admin officer kat Selayang Hospital.. Dalam hati dah meraung-raung dah.. apasal lar surat tu tak basah kena hujan sampai takleh baca.. or diorg hantar kat salah hospital ker.. haih..
Maka tamatlah cuti bersalin saya.. selamat dah 6 bulan dok umah.. berat nyer hati nak tinggalkan Bella.. takleh lar susukan Bella pagi2, main dgn dia, mandikan dia.. sbb dah kena balik OT, masuk ICU, dgr bunyik beep, beep, beep kat spital..
InsyaAllah mid January ni dah start keje balik.. yes, I know Bella will be in good hands, I have a nanny at home taking care of her, in fact this is the same nanny that took care of me since I was a baby.. believe me or not!! She has been with my family since I was less than 1 year old!! (now 31 already!!) She took care of all my siblings.. and now she’s taking care of my daughter.. Kak Yah has been with us since I first can remember.. I know Bella is in good hands and her daddy will be at home too whenever he is not at work.. It is just that, I will miss her.. thats all..
Posted on January 3, 2012 November 27, 2012 by Dr Halina Mohd YunosPosted in MommyhoodTagged work. Next Next post: Introducing Solid Food to Our Little B!! 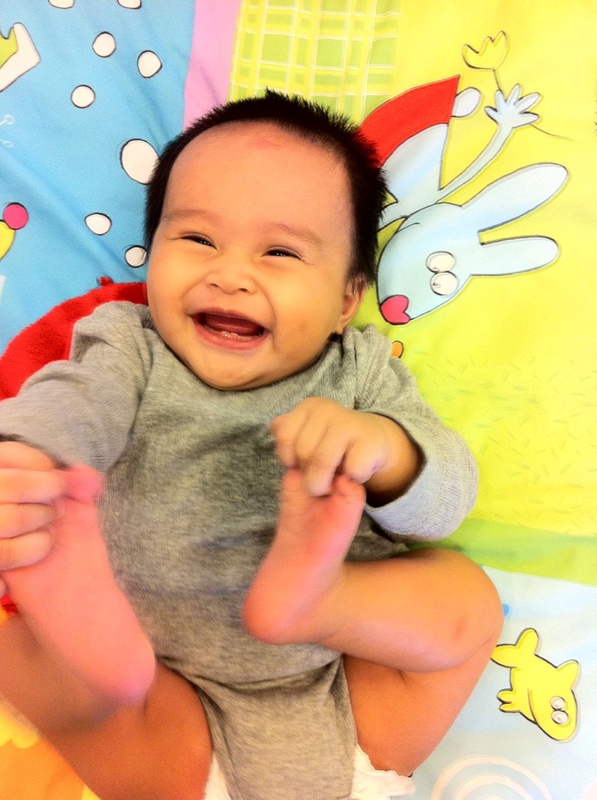 Hoh, Bella so comellllllllllllllllllllllllllll *cannot tahan to give a comment since I was silent reader*. Chayok2 Mommy Bella. Be strong, yeay! aduh, mesti rasa macam ada rama2 dalam perut kan? takper la dr, balik dari keje nanti main la puas2 dengan bella..hehe..nampak dia kat nona omg so cute!! btw, bella ni susah ke nak dengan orang? farah fauzana dukung dia sekejap dah nangis..hehe..
Sabar dr. terharu baca statement dr.
wowoo..baby b looks veryyyy happy n cute in that pic sis!=DDD..
itulah pengorbanan seorg ibu n doktor..:) selamat kembali bertugas halina!! Dieb, ko bila nak tambah? Dr pun rasa macam tu? Semua wanita bekerja memang akan feel the same especially the first day bekerja semula. Tak dapat concentrate kerja. Lagi-lagi kalau menyusu badan, bila breast membengkak kat ofis, baby dah ‘time’ nak menyusu, adusss sayunya hati. How old is Kak Yah then? Yang penting she’s in gd hand… the rest will digest slowly.. InsyaAllah. Happy back to work ya Doc. memang berat hati nak tinggalkan anak kita even after a short weekend pun..terharunye baca dr dpt nanny yg sama tu..tapi dr dapat nanny yang sangat bagus, sure tenteram hati nak tinggalkan isabella..btw selamat kembali bertugas demi anak bangsa ye dr..
selamat kembali bertugas. untung doc ada org yg boleh dipercayai jaga ur baby. senang sikit hati nak tinggalkan dia di rumah. hi dr harlina, i baru je follow ur blog, amazing! i like ur story about ur family especially bella, oh she so cute!, rase nk cubit2 when she sit on the baby chair, hehehe, sempena 2012, hope ur success in career, family and so on….keje jgn xkeje! halooooooo giler x rindu.lama nye akak nyer maternity leave.syiokk !! OT tu apa? ?over time ke?? just read this entry. your intro is hillarious!…heheheh. love it so much. will surely follow your blog. understand how u feel when we gonna leave our baby to go for work..we gonna miss each moment of they smile and laugh..hoh..me too have the same problem that i don’t want to go for work just because wanna stay with my baby..
My family also have a Malay nanny who have worked with us for 33 years! I’m 29 this year and she started working with us 4 years before I was born to take care of my 4-year old brother (that was in 1981). Now she is looking after my brother’s four children!